This post is taken from Vince Skillcorn's Facebook page. It talks about the importance of learning how to fall. Do you have children or know people who take part in Judo classes? Have you seen people being thrown around the room and think "that looks painful." ... and yet the person who has just been thrown jumps straight back up and tries to do the same thing to the other person. Judo is great fun and to be able to throw somebody around the room requires everyone taking part to know how to fall safely this is called 'Ukemi' in Japanese. This is very important for beginners to learn for the obvious safety reason (reducing concussion's and broken bones), from the very first class. - In all honesty I think most sports (football, rugby, hockey etc.) would benefit from learning how to fall safely. But break falls are an integral part of turning a student from beginner to expert. 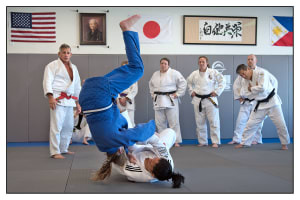 Learning to fall safely helps build confidence, which in turn enables the Judoka to try more attacks, take risks and throw more (without fear of being thrown). 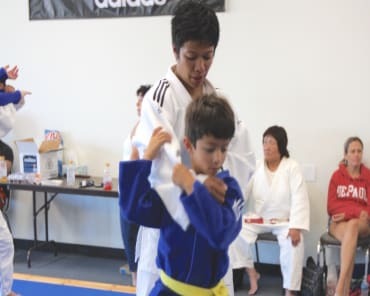 As a coach or parent you can quickly see judoka who are practicing with (and without) fear of being thrown. A person who is fighting WITH fear will generally attack less, have their arms straight, resist movement and try to keep distance between them and their partner at all costs! A person who is fighting WITHOUT fear will attack more, try to move their partner, get close to them and try to turn their back. Break falls are so much more than just being safe, it is confidence, progress, improvement and the key to throwing. There are many break falls within Judo here are a few break falls your Judoka should know and be practicing.